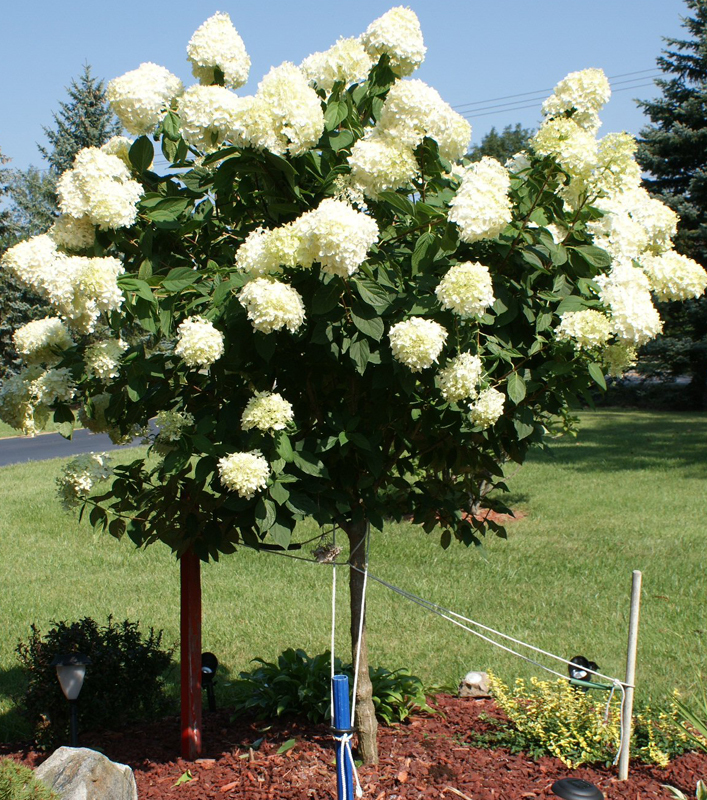 Buffalo-NiagaraGardening.com > Garden tips > Question: How should a Hydrangea paniculata ‘Limelight’ tree be pruned? Question: How should a Hydrangea paniculata ‘Limelight’ tree be pruned? I bought a Hydrangea paniculata ‘Limelight’ tree in the fall of 2012. I pruned it a tiny bit as my goal is to have it grow taller. They say to prune it in late fall or late winter. This year I had a ton of big, heavy blooms, and many of the branches drooped over. 1) Should I prune back the thinner branches…and, if so, by how much? Will this actually produce sturdier branches, or make more weak ones? 2) Should all the blooms be cut off about now., and if so, just cut them to the first leaf node? I read conflicting things, from leaving the tree alone (no pruning), to cutting it all back by a third! I love this tree and want it taller yet sturdy enough to bear the weight of the flowers. NOTE: There have been many helpful responses in the comments below. There are a lot of comments! You may have to go back a few pages to find the information you are looking for. Paniculata Hydrangeas are some of the easiest hydrangeas to care for. They can be pruned in fall, winter or spring. They bloom on new wood so you need not take too much care in where to cut. I suggest that you prune out any crossover branches and any branches that interfere with the look you are trying to maintain. With very little maintenance you will have a beautiful and long flowering tree. Landscaper from Newtown, CT demonstrates what and where to cut this type of hydrangea tree and why you should. He also gives a phone number to call with other questions. Seeing how to prune in a video really helps! Pat, thanks so much for sharing that link. That is a really helpful video. Thanks for that information. It’s good to know when you can prune it because you’re not supposed to prune most trees in fall. Thanks to both Pat and Mischler’s for the responses! One question for Mischler’s..will pruning a branch by 1/3 produce one (or more) sturdier branches, or just more thin, weak branches? My poor tree sagged BADLY from the weight of the gorgeous blooms, and I’m trying to create thicker, sturdier branches. THANKS! Connie…this is a GREAT site! Thanks for your efforts. As you already know, pruning does encourage branching. To produce the strongest branching your best bet is to cut back the branch leaving only 1 or 2 nodes. Martha Falsone added a comment, but it ended up on the wrong page. She says: pee gee hydrangea tree…I was told to give tree severe pruning…I did this last year…..my tree is gorgeous..heavy blooms. (716) 689-6764 It may be too early in the year…? Good luck! Hydrangeas, especially in all of there varieties, seem to be more available in the nurseries later in the season….like the end of July or August. Finding a specific variety may be harder earlier in the season because the nurseries like to have them out when they are blooming. It’s a lot easier to pick one out when its in bloom, too. Let me know how they do! Mine bloomed so heavily last year that the branches all drooped and looked awful. I pruned some branches last Fall to see which will be stronger..the pruned or unpruned branches! Poor thing got pretty beat up during the winter, but it appears to be leafing out. Why are the leaves turning yellow. Heather, if you’re having a problem with a particular plant, the best thing to do is to contact Cornell Cooperative Extension in your county. You could also clip off part of the plant, put it in a plastic bag, and take it to a locally owned garden center that has trained staff who can help you diagnose your problem. Find out more here. Thought Limelight Hydrangea Trees are of sunlight organisms, what would be its chances of survival in a shade area with only afternoon sunlight?? How to support the Lime-light tree when it blooms. My flowers are so big and heavy that when in full bloom they all bend over and hang down. I would like for them to stay up straighter. How came I support this plant. It is about 4 years old since I planted it in my garden. main stem trunk is about 3 ft. tall and top stems are about another 3-4 feet long. I have been pruning each year to get thicker and stronger stems but every year the same thing happen when it blooms all the stems bend downward due to the weight of the flower. I tried garden twine with a center post to tie it to but the brand broke where the twine was placed to hold the stem up. It would be so nice if there was a support for this tree. do you know of any. It is getting to be such a problem that my husband wants to take it out because some of the branches fall over into the pathway to the backyard. So I cut them back when it is a problem. I do not want to move it I just need to find a way to support it or how to get the stems stronger to hold the flowers. Any information would be appreciated. I saw a picture somewhere online some time ago where tall decorative edging was used to help support floppy hydrangeas. Take a look at plowandhearth.com. They have some really beautiful metal scroll work edging (18″ high) or garden fencing (34″ high) that may help with your issue without detracting from the looks of your garden. I had that problem last year and both fertilized the heck out of it and pruned heavily. This year I have more blooms, but they are smaller and don’t cause the branches to droop….go figure..???? I have never had more questions about a plant then I do with this tree!! Too little water, too much, yellow leaves, drooping branches, fertilize/don’t fertilize, blooms that stayed green and never went to white or pink…AUGH!! Yet, I love the thing and will keep at it till I learn! I will admit it is almost without issues this year (year 3), so MAYBE I have it figured out?? Don’t rip it out, keep playing with it. It’s a challenge, and worth it in the end. PS..the one growing at my library is totally ignored by humankind and it’s BEAUTIFUL. I think we’re torturing ours with too much love….. I have a limelight hydrangea tree and the blossoms are turning brown and wilting. It is Aug 13th in Minnesota. This isn’t the natural browning you see in the fall. What could this be? Judy, Buffalo-NiagaraGardening.com focuses on Western New York. For questions in other regions, you should contact your local extension service. I hope that helps. PS In the meantime I’m telling people it’s a “Weeping Hydrangea Tree”….LOL! Love the hydrangea limelight tree so much that i bought one and planted it!!! Little did i know….the deer love it too!! UGH!!!!! Any advise to defer them from the tree? Our neighborhood is frequented by fairly large amount of deer. I put netting around the tree after I planted it in September to preserve the blooms it had when i bought it after I found that a couple flowers had been bitten off. The netting worked, but I don’t want to have to put netting all over the tree/blossoms every year, nor do i want to dig up the tree, but don’t want to lose everything to the deer! Would welcome any and all advise!! Thanks in advance!! Deer can be tough on a garden. There are many, many suggestions for deterring deer. The reason there are so many suggestions is that none of them work all the time. There are many sprays you can try. You generally have to repeat the sprays after a rain. They smell bad to deer and may smell bad to humans, too. You can try hanging soap or hair in the tree. You can try hanging old CD’s in the tree. You can fence your yard or get a dog. Search this site for deer and you’ll see more articles with lots of tips about deer. Best of luck! Would love to purchase one. Can’t find it anywhere. Can you possibly direct me? 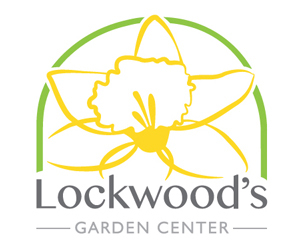 The stock of plants at garden centers varies throughout the year and is different from garden center to garden center. It’s best to contact them directly to find out who has what in stock. 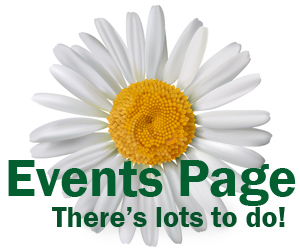 To find contact information, you can click on the ads here on the Buffalo-NiagaraGardening.com website or go to our Gardening Directory. I hope that helps. I live in NW Iowa. I have one of these trees around my patio. It only gets the evening sunlight. I never prune my tree! I know this sounds crazy as I see all my neighbors trim theirs back every fall. Some of them get no blooms at all the next year and some get small blooms with hardly any foliage on the limbs. The next year when they leave them alone, the look the best! From day one, I’ve been the only odd neighbor to leave mine alone. Let the blooms fall off by themselves. New ones come back in spring, With plenty of leaves. I have never had a drooping problem either. I say let Mother Nature take it course on these beauty’s and fend for themselves. Mine looks better than the neighbors that are always pruning theirs. Linda,if you can’t find in garden center,try QVC. I purchased one from them and the tree is gorgeous! I do have the droopy problem because the flowers are so big,they look perfect then first big rain,after fully bloomed,droop. I’ve been pruning them back extensively each year hoping they get stronger. It seems to have worked a little but not perfected yet. Hope it does because absolutely love the tree. Oh tried the mother nature course for 1st into second season,HUNDREDS of blooms drooping. If anyone has figured something out PLEASE let us know,it would be much appreciated! Diane, there was a comment that probably answers all your questions, but there are so many comments now that you would have to dig to find it. I added a note in the article with that information. I hope that helps! My hydrangea tree had so many large blooms on it when it rained the bark broke in several places. I tied it. Now I’m wondering how I should prune it in the fall. Is there a way I can prune it so the flowers don’t get too large and heavy? You can read the previous comments to get more information. Here is what Mischler’s Florist and Greenhouses advised in a previous comment: As you already know, pruning does encourage branching. To produce the strongest branching your best bet is to cut back the branch leaving only 1 or 2 nodes.